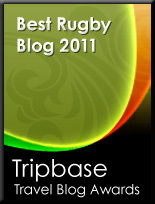 TOTAL FLANKER...a rugby blog: Volcano set to erupt? So, Brian Ashton has managed to surprise us all with the inclusion of Leslie "the Volcano" Vainikolo in England's 6 Nations training squad and with impeccable timing Robert Kitson of the Grauniad has managed to come up with a great story about the big Tongan. Apparently, following Vainikolo's spectacular first outing for Gloucester this season in which he plundered 5 tries against Leeds, a local Gloucester paper could not resist running with the inevitable "Volcano Erupts" headline (so I'm nothing if not original), with the somewhat absurd consequence that its newsdesk then apparently received various calls from old ladies concerned that a volcano had erupted in Gloucestershire and worrying whether they were about to be engulfed by molten lava. As Kitson says, you really couldn't make it up! After watching Tonga play and beat the US and Samoa in Montpellier during the World Cup, I wish the US would find a way to get some Tongans on our roster. The thing that really struck me and my son at the games was how hard the Tongans hit-you could hear the sound of bone against flesh even where we were sitting. Nursedude; pretty sure USA has used Samoans in the past? Stry Tongans have tended to turn up for Japan. Will this blatant piece of chequebook selection put an end to the “NZ poaches Islanders” argument? Sportsfreak brings up kind of a bigger point. My posting was meant tongue in cheek at how lousy USA rugby is and how impressed I was with the Tongans during the RWC. It's true that a good number of players on the Eagles were not born in the land of Bruce Springsteen. Our most high profile player from the RWC was originally from Zimbabwe(Thanks Mr. Mugabe) International Rugby, compared to football/soccer, seems to have a lot of mobility, like pacific islanders playing for the All blacks, Kiwis playing for Scotland, Wales and other countries, Pieter De Villiers(south African)and Tony Marsh(Australia) both wore the 'coq gaullois' of France-in the end, for any rugby playing nation to complain about import players ends up being a case of the pot calling the kettle(all) black. Thing is, just because England has now selected Vainikolo, it doesn't necessarily make the actions of other nations (or the rules governig eligility) right. Many English rugby fans are distinctly uneasy about this selection (and have been so with regard to the selection of other non-English players to the natioal side in the past)I do wonder however whether this unease is exacerbated by the fact that Vainikolo is so obvously not English - I know that sounds a tad racist but it's not meant to be, it's just that he is so obviously a Pacific Island import that he's going to stick out like a sore thumb - the English traditionally don't breed 17.5 stone monster wingers after all. My preference, for the record, would be for a tightening up of the eligibility regulations to country of birth or parents' country of birth. The grandparents rule should be scrapped, as should the three year residency rule. Residency should only be a factor, imo, if the player in question moved to the counry in question before his 16th birthday. As the regulations stand England would probably have been daft to ignore Vainikolo. It wasn't a case of "chequebok selection" as Sportfreak puts it (the RFU didn't fund the switch from RL in this instance) but is a clear case of selectorial opportunism by Brian Ashton.